To assess the adequacy of the current budget allocation for the Community Services Grants scheme and to identify options for any increase. a. Approve to remain with the current funding allocation and formula for the Community Services Grants Scheme. That the Council discuss the officer’s recommendation. The Community Services Grants scheme provides grants to Community and voluntary organisations that provide support services to Napier residents, often in their time of need. Grants contribute to the operational costs of organisations and is considered a ‘top up’ or funding for costs or organisations not provided for by other funders. 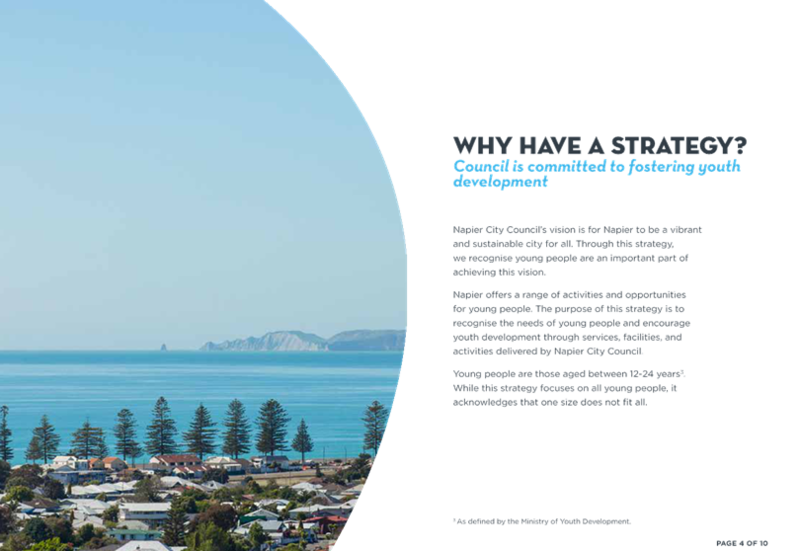 Rates subsidies are also available to groups who own a property in Napier that is used to provide community services in Napier. The current allocation is $97,200 per annum and set at $1.60 per head of population. All applications are assessed using a robust ranking system along with a committee assessment. Decisions are made by a Grants Committee and endorsed by Council. At the grants allocation meeting, the Grants Committee Chair, Councillor Boag suggested the Committee request an increase in allocation. It was agreed that officers would analyse recent funding rounds to determine a basis for an increase. The demand for funding has declined over the last five years with the amount requested declining sharply in 2015/16 and then returning to around 90% of the demand experienced five years ago. 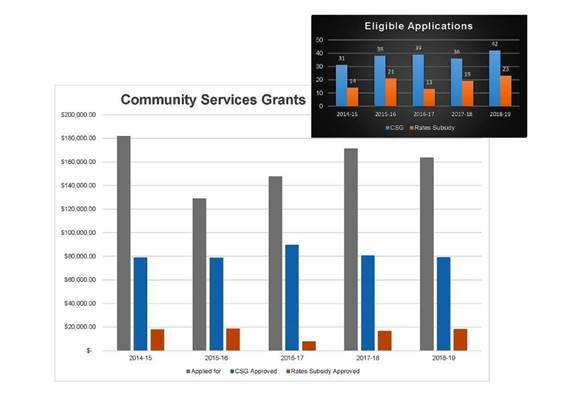 The number of eligible applications has increased over time with lower grants being requested by groups. The following graph shows the demand and funding allocations over the past five funding rounds. It has never been practice in this fund to fully fund all applications, although some very small requests (in the 100s) have been fully granted. If all medium/high to low risk applications were fully funded in the last funding round an allocation of $125,000 would have been required ($2 per head of population). The Committee managed the allocation and provided higher levels of funding to those with applications that aligned strongly with the fund’s purpose and presented low risk for grant funding in this last round. Given the above information, officers recommended that there was not sufficient cause to increase the allocation at this time but that this should be reviewed after the next funding round and should there be an increase recommended at this time, the increase could be included in the relevant annual plan. The Committee agreed to this approach. The matter was raised at the last Community Services Committee meeting. It was suggested the amount of funding should be increased to $1.80 per head of population and CPI could also be applied. Should Council wish to increase the allocation, it is strongly recommended that the existing formula be used as the mechanism for any increase rather than introducing a combination of mechanisms (i.e. population and CPI adjustments) that overcomplicate this relatively small funding scheme. This matter is an operational matter with low significance in terms of financial or social impact given the amount of funding concerned. Raising the amount per head of population to $1.80 was discussed at the Community Services Committee meeting. Applying this in 2018/19 based on projected population increases would increase the allocation to $113,580 requiring an additional $16,380 pa. There is no funding available within current budgets to meet this increase. An increase in allocation may encourage more groups to apply to the scheme and/or groups to apply for higher grants. This grant scheme does not fully fund operations of organisations so they still need to source funding from other providers. Introducing a new formula for the allocation may have unintended consequences, for example in a Census year there is the potential for two increases to be applied – population increase and CPI adjustments. b. Increase allocation using a combination of population and CPI adjustments and increasing the per head allocation to $1.80. c. Increase the allocation using the current formula but increasing the amount to $1.80 per head of population. The analysis conducted for the last five funding rounds does not provide sufficient cause to increase the allocation at this time outside of the current process. A small increase in the total allocation will be achieved through population growth. Should Council wish to increase the allocation for the Community Services Grants, it is recommended the current formula be used as the mechanism to achieve this by increase the per head of population rate. The purpose of this report is to obtain a resolution of Council to allow the sale of food and drink to the public within Herschell Street as part of the White Night event on the 20th October 2018.
a. Resolve to allow the sale of food and drink to the public within Herschell Street at the White Night event on Saturday 20th October 2018. Napier City Business Inc will once again host, in association with the 2018 Hawke’s Bay Arts Festival, the Napier White Night on Saturday 20th October 2018 in Napier, an arts and entertainment event set in the heart of Napier’s arts precinct, Herschell Street. Selected Napier venues within the Arts Quarter will open their doors and showcase the diversity of art and culture in our local community. This is the second White Night held in Napier, the first being held in 2017 and attended by more than 3000 people. White Night is part of the Hawke’s Bay Arts Festival and is free to the community. Herschell Street will be closed to traffic and food trucks will operate from within this street from 5.00pm till 10.00pm. No alcohol will be served. Napier City Council is a silver sponsor of the 2018 Hawke’s Bay Arts Festival. The Trading in Public Places Bylaw prohibits the sale of goods to the public within the city centre unless a resource consent or a specific resolution of Council has been obtained. This report to Council seeks a specific resolution of Council to allow the sale of food and drink to the public on this day and within this time period. Napier City Business Inc will host this event in association with 2018 Hawke’s Bay Arts Festival. They have communicated with all hospitality operators within the city and have received full support. The Trading in Public Places Bylaw prohibits the sale of goods to the public within the city centre unless a resource consent or a specific resolution of Council has been obtained. The presence of food trucks at this event will add to the festival atmosphere and will provide a ‘street eats’ experience for festival-goers. The inaugural White Night event in Napier’s city centre in 2017 was very successful, and saw more than 3000 people enjoying the streets, art galleries, shops, and restaurants in a time when Napier’s CBD typically sees fewer numbers of visitors. The provision of food trucks within the closed Herschell Street will provide street food to the public, and add to the vibrancy (and smells) of the street during this event. Napier City Business have consulted with the city’s hospitality sector, who have been supportive of this event. White Night is part of the Hawke’s Bay Arts Festival, and as a free event, give access to arts to a much wider spectrum of the community than the paid performances available in the festival programme. To advise Council on the process undertaken in reviewing the Youth Policy and to request approval to release the draft Strategy (attachment one) for stakeholder and public feedback prior to adoption by Council. a. 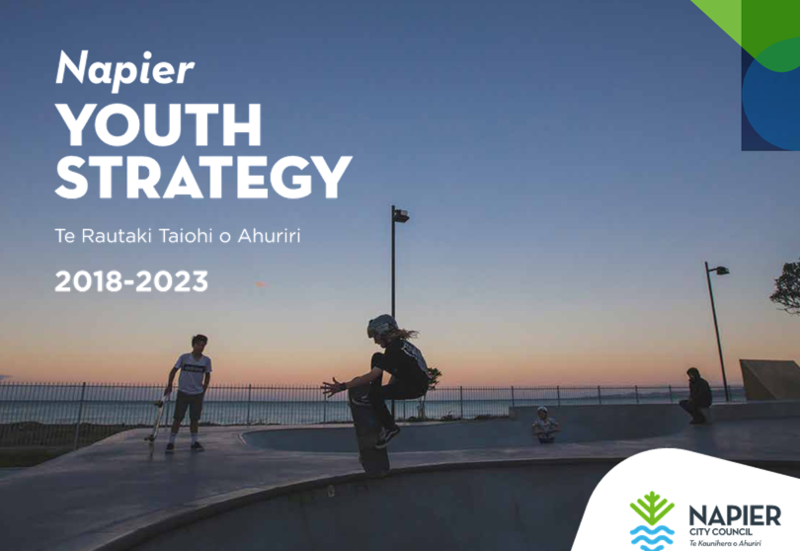 Approve the release of the draft Napier Youth Strategy for stakeholder and public feedback. This revised draft Strategy builds on previous policies and programmes and is the source document for Council’s youth development planning and activity. The strategy has been developed through engagement with students, young professionals and parents of young people through surveys, activities and focus groups. The information and feedback (attachment two) helped inform the development of the strategy. Youth Council have been a key contributor to the Strategy and will continue their involvement through consultation and subsequent delivery of the final strategy. This matter has significance for a sector of the community and as such, engagement with youth is a priority in gaining community feedback. In addition, we are taking a ‘for youth, by youth’ approach and will support young people to lead some of the engagement activity. Key stakeholders will be invited to provide feedback, while public feedback will be sought over a four-week period - see feedback plan (attachment three). Following community feedback, any significant changes will be integrated into the Strategy for Council adoption. An Action Plan will be developed following adoption of the Strategy. The Action Plan may require funding; this will be included in current budgets or externally sought. The final Strategy will include an Action Plan that incorporates relevant actions arising from feedback received. These actions may link to other Council processes and policies. Feedback may be misaligned with the draft; however, pre-engagement activity has reduced this risk. a. Notify the draft Strategy for stakeholder and public feedback before finalising for adoption by Council. b. To not notify the draft strategy at this time. Considerable research, stakeholder engagement and work has been completed to get the draft strategy to this stage and it is recommended that further feedback be sought on the draft before it is finalised by Council. The total population of Napier in 2013 was 57,240. Of this, 9,291 or 16% were youth between 12 to 24 years of age. There is a large concentration of youth in Nelson Park Ward (34%) and Taradale Ward (34%) (table 1). Napier has a smaller percentage of young people in the 'tertiary education and independence (18 to 24)' age group (7.7% compared to 9.6%). This reflects the trend of young people leaving the area for work, study, travel or other opportunities, not likely to return until later in life - figure 1. Napier has a larger proportion of European and Māori compared to New Zealand and Hawke’s Bay and smaller proportion of Asian and Pacific Peoples. 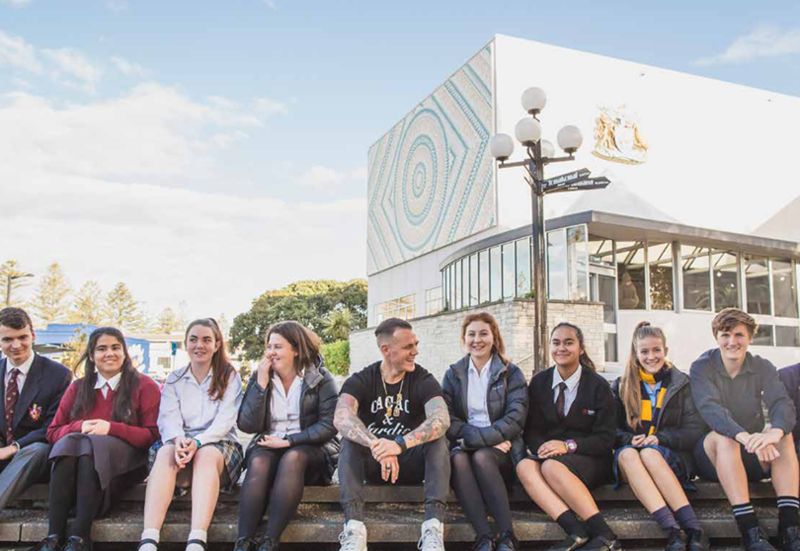 Napier has a higher percentage of youth achieving NCEA Level 1 and 2 than the national average but is lower in achieving NCEA Level 3 or higher. Napier has a greater proportion of people employed in the retail, accommodation & food sectors, and fewer managerial, professional opportunities. Employment opportunities here don’t necessarily require a highly skilled workforce and these findings reflect this. 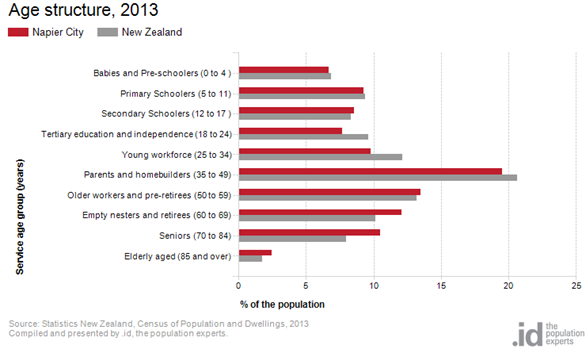 Youth in Napier are more likely than youth across the country to not be engaged in employment, education or training. However, they are slightly more engaged across Hawke’s Bay. 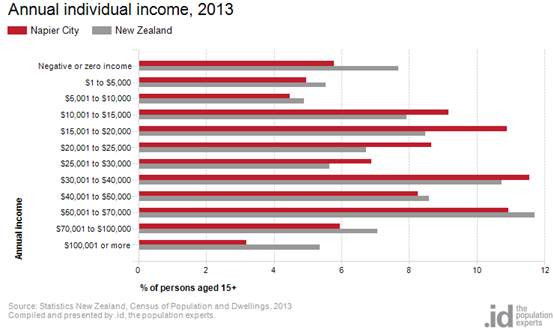 Napier has a lower proportion of people earning a high income (those earning more than $70,000 per annum) as well as a lower proportion of low income people (those earning less than $15,000 per annum) – figure 2. The average annual median earnings from wages and salaries for youth in Napier is close to the national average and slightly higher than the Hawke’s Bay average. The Napier youth survey was developed by Zeal Hawke’s Bay and YCON. The survey was for 12 to 24 year olds and asked a range of questions to find out more about young people in Napier. The survey took place from July to September 2017 and received 307 responses. The largest proportion of respondents were 17 years of age and over and two thirds of respondents were female. Over 70% of respondents were of NZ European decent, while 20% were of Māori descent. The sample size is not sufficient for statistical confidence and differs from other data sources. While the survey provides useful information, the wider context has also been considered in developing the priorities for this strategy. The survey found that young people in Napier generally feel supported through their networks including friends and school. Young people would like more leadership and employment opportunities, and support around education and pathways to employment. The survey also found the majority hold some form of drivers licence. Information from five different groups was also used to inform this strategy. Discussions were held with students; young professionals, and parents of young people. · Younger youth also showed an interest in the environmental space. There appeared to be a lack of knowledge and information particularly around leadership, employment and community e.g. volunteering. There is a need to better educate, advertise, and promote what opportunities are available to young people. Removing barriers to participation and recognition for leadership also featured. Organised youth events and safe spaces for teens to hangout. Self-defence for all age groups. Support services and online education. Low cost public transport to get around, having a phone and never going out alone. Mentoring, leadership opportunities e.g. leadership conferences. Educating young people and promoting what opportunities are available to them. Incentives to get young people to participate as well as recognising those for giving their time e.g scholarships for students in mentoring or leadership roles. Ensuring learning is fun and interactive. Offering a range of learning options and methods. Providing more advice to young people and encouraging them to follow their interests. Work experience, life skill courses and opportunities to support this. More jobs, higher pay and less unemployment – while also keeping safe in the workplace. Advertising of job opportunities and communicating what is available, career talks in school and seminars, and mentoring. Work experience, internships, graduate programmes (to retain locals and draw young people back here to work). More marketing and promotion of opportunities to get involved. Activities including sports and recreation, clubs, youth groups, and volunteering. Interest in the environmental space e.g clean & green and horticulture. Accessibility e.g transport is a barrier for young people - introduce incentives to encourage interest and involvement. 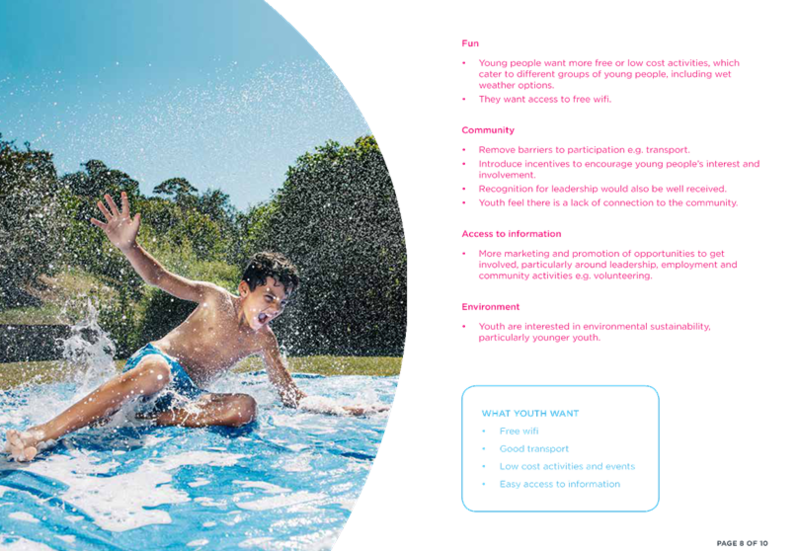 A need for more facilities and activities including wet weather options, as well as low cost and affordable options. Access to free wifi is also important to young people. · Cheap, good transport. Night buses. · Mechanisms for kids to have a voice. · Better links between Council and schools. Wider social and economic contexts and dominant cultural values set the big picture within which young people grow up. Healthy development is shaped by young people having positive connections with many social environments. Youth development addresses both ‘risk’ and ‘protective’ factors, as well as the range of skills young people need. Supporting and equipping people for successful relationships with young people. Providing opportunities for young people to increase their control of what happens to them and around them, through advice, participation and engagement. Youth development is continually informed by effective research, evaluation and information gathering. In combination, these principles contribute to the desired result of positive youth development, where young people gain a: sense of contributing something of value to society; feeling of connectedness to others and to society; belief that they have choices about their future; and feeling of being positive and comfortable with their own identity. A positive youth development approach: forms the platform for consistent youth policies and programmes and for improving our ability to achieve better outcomes for all young people; seeks to foster the ideal environment for young people to learn, grow and contribute, thus supporting them to move into responsible adulthood; and acknowledges individual young people’s evolving capacity to initiate change and the interaction of the wider social and economic factors that either restrict or enable positive outcomes. 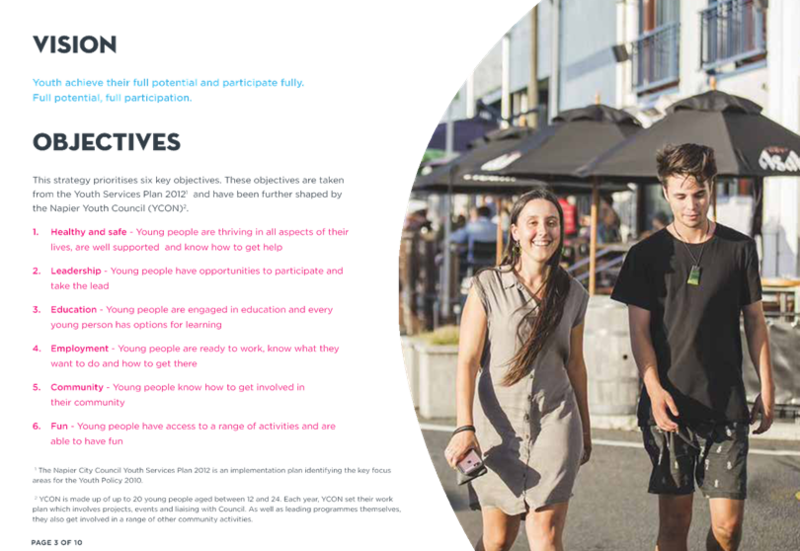 The actions identified in this document for community, hapū and iwi are to promote the active participation of young people in community development initiatives; promote programmes that provide opportunities for disadvantaged young people to extend their skills; positively promote the contribution that young people of different cultures and ethnicities make to the life of the community; support the development of community-based youth health centres; and strengthen working relationships across sectors on youth-specific projects. The vison of the Youth Health Strategy is “excellent health services working in partnership to improve the health and wellbeing of our people and to reduce health inequalities within our community”. In Hawke’s Bay, youth show some health trends and risk factors higher than the New Zealand average: this includes teenage pregnancy, sexually transmitted diseases, suicide rate, diagnosed mental health disorders e.g. anxiety, depression, smoking prevalence, sole parent benefits for under 25, unemployed, and involvement with justice e.g. apprehension. All of these things can affect a young person’s ability to function well in society and can impact on their future. Whanau and community supported, resources and opportunities, strength based focus, youth as part of the community, collaborative and multi-sectoral, and outcome driven. 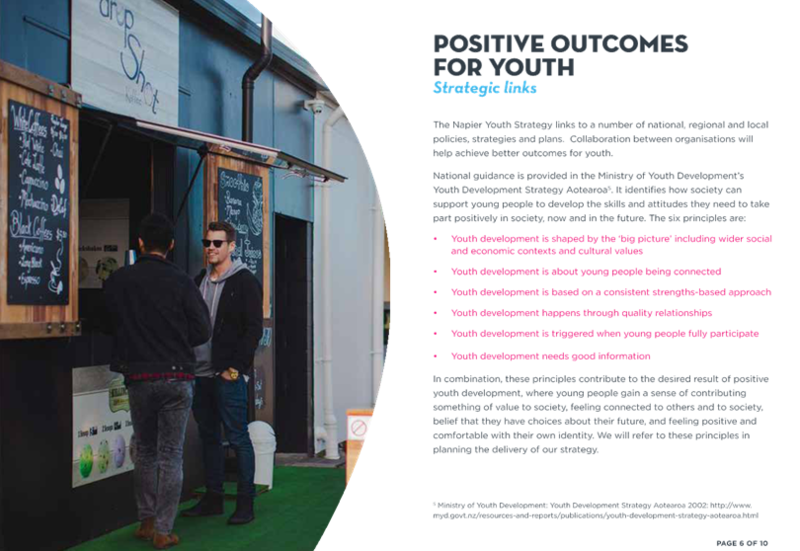 Youth in Hawke’s Bay report healthy as feeling supported and accepted; positive relationships with parents and connections with others; good headspace; positives influences; independence; and taking responsibility. The Youth Health Strategy provides a framework to enhance collaboration, alignment and collective impact across organisations working with youth. The goals of the Youth Health Strategy align well to the key principals of this strategy. Napier is a vibrant city through excellent strategy and planning; social cohesion is achieved for all ages and ethnicities; innovative services are provided using technology whilst protecting the environment; technology connects Napier to the rest of New Zealand and the world; Napier is an appealing tourist destination; business-friendly economic development is encouraged. Services and facilities support social and recreation opportunities; community safety is supported and improved; social services are supported. Each of Council’s activities contributes to some or all of the Community Outcomes to meet the needs of the community. Council recognises that youth are a significant part of the community and fostering youth development is a community development priority. Feedback on the draft Strategy will be sought from the following groups, using the methods listed. A four-week feedback timeframe will be provided. That the apology from Councillor Taylor be accepted. The Local Alcohol Policy remit was approved with the following voting results: 95% for, 1% against, 4% abstained. The remit seeks changes to the Sale and Supply of Alcohol Act 2012, as well as calling for reviews of other possible tools for mitigating alcohol abuse, including changes to the minimum drinking age, taxation and so on. Mayor Dalton, Deputy Mayor White and Cr Wright had the opportunity to tour the QEII aquatic centre while in Christchurch; it is an appealing community asset and Napier’s own development once finalised, is expected to be equally attractive and well-utilised. Natasha Carswell is the recipient of the annual national Safe Communities Foundation New Zealand Safe Community Award in recognition of her outstanding leadership and support for Safe Communities at regional and local levels. That the Minutes of the meeting held on 6 December 2017 were taken as a true and accurate record of the meeting. (Strictly for information and/or referral purposes only). The purpose of this report to present options to celebrate and commemorate the achievements of Napier born and raised Nyree Dawn Porter, a celebrated actress, singer, and dancer, who made it to the West End in numerous shows, as well as film and television appearances abroad. Ms Porter passed away in London in 2001. She continues to have family residing in Napier. The Strategic Planning Lead spoke to the item, noting that further to the options outlined, brief investigation into lightboxes has been undertaken. Theatre Lane is privately owned, and there would be difficulties in providing power to that site. However the outside entrance to the Municipal Theatre could be considered. The images and or information could be updated as other exhibitions or events take place. · The naming of the dress circle was fitting for someone who had spent their life dedicated to the theatre and arts. · It will be important to confirm that naming of the dress circle was not bought by any other parties during the renovation fundraising for the theatre. · While Ms Porter left Napier during her 20s, she remains an inspiration and aspirational for other young Napier artists and performers, demonstrating that they may also achieve on the world stage. · There may be opportunities to commemorate Ms Porter’s birthday as another way to celebrate her life. a. Endorse the proposal to rename the Municipal Theatre’s dress circle the ‘Nyree Dawn Porter Circle’, and to provide further exposure of Ms Porter’s achievements by displaying informational material within the theatre foyer for a limited time. b. Approve that further opportunities to celebrate Ms Porter’s achievements are explored as projects and funding opportunities arise. The purpose of this report is to outline the changes that have been made to the Draft Ahuriri Estuary and Coastal Edge Masterplan, and to adopt the Final Ahuriri Estuary and Coastal Edge Masterplan as provided in the attachment. · There was very strong public support for the Ahuriri Masterplan through the Long Term Plan process, which is believed to be ambitious and aspirational, addressing multiple important issues for the Estuary and surrounds. · There are a number of supporting projects sitting under the Masterplan, which have been prioritised as part of the LTP. · The level of engagement that has taken place with mana whenua and tangata whenua during the drafting and finalisation of the Masterplan will continue at project level as these supporting projects are rolled out. · The marina extension at Meeanee Quay is one of several initiatives that will be worked on together as part of the Inner Harbour Plan. The suggestion to include another marina rather than extending one of the two existing marinas over the cockle beds will be taken back to the planning process. · The updated Masterplan recognises that Perfume Point is working well as it is; underground infrastructure (power etc.) will be added to increase the flexibility of its use regarding events, but it is no longer intended for higher development purposes. The apartment dwellers who were originally concerned about the development proposal have been advised of the change and are very positive. a. Adopt the Final Ahuriri Estuary and Coastal Edge Masterplan. To increase event funding for two existing supported events; the Hawke’s Bay Arts Festival and the Horse of the Year. · There is unqualified support for the proposed increase in funding allocation to the Hawke’s Bay Arts Festival, which is now competitive with other regional arts festivals and provides direct benefits to rate payers in the form of events in Napier and free events as well as wider social and economic benefits. · Views were split as to the relative benefits to Napier from the Horse of the Year event. The event is primarily in Hastings and there are are no direct benefits to Napier. However it was noted that catering and accommodation spend tends to be high from attendees of the Horse of the year event, providing notable indirect economic benefits for the city. b. That a DECISION OF COUNCIL is required urgently as planning is being undertaken now for both events and marketing promotion will soon be underway.